I will be speaking at this year’s RSA Conference, discussing how hardware-based security is, and will continue to be, instrumental in defending against emerging threats and how Intel will continue to invest in this area. The RSA Conference is arguably the most attended annual cybersecurity gathering and Intel looks forward to being part of the event. 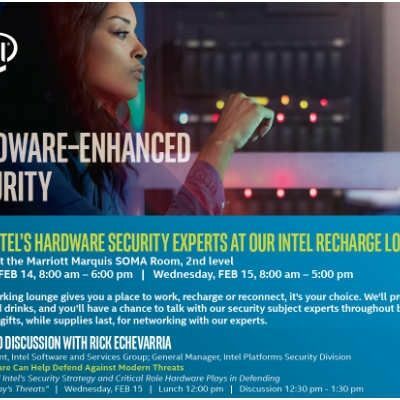 This year, we are getting a chance to speak directly to security enthusiasts at a special lunch session on Wednesday, February 15th at the Intel REcharge Lounge. Join me at 12:30 p.m. for a light lunch and a great discussion. Technology is advancing rapidly and so are the threats, meaning that protective software alone will not suffice. Security will require every possible advantage to keep pace with the emerging threats. Hardware will be a powerful ally from the proper design fundamentals to embedded features that software can leverage to increase security, safety, and privacy. With that in mind, Intel is stepping up and encouraging other technology firms to do the same, so make sure to come register for this session. In one of my previous blogs, I outlined the all-important balancing act that goes into creating any successful security program. For a security feature to be effective, it needs to reduce the risks to security, safety, and privacy while not impeding the user experience, and come in at a reasonable overall cost. These are the aspects that should drive the designs of future technology to enhance security. Though it’s a challenge, security savvy organizations have shown that these pillars can function in harmony, as Intel’s efforts have recently demonstrated. We’ve shown that the customer’s needs must be met at a price they can afford and in a way that does not detract from their computing experience. For every device that computes, hardware is at its core. Firmware, operating systems, and applications all rely on the hardware. This is an advantageous position for threat monitoring and providing deeply entrenched protections. It is also the place most difficult for attackers to compromise and maintains the best visibility of the system. The time is now for the technology industry to use this resource. Come to my talk so we can describe our current thinking and get your always valuable feedback. Intel is synonymous with computing. We have a vested interest to make sure that confidence in technology remains strong and impediments such as cyber-attacks are not detrimental to the experiences that connect and enrich the lives of users. Will security become such a barrier to technology adoption? Not if the leading companies work collectively to create more secure products and services. Cybersecurity is a critical issue, and technology innovators must come together to make products secure, safe, and private for customers. Intel will help lead the way. I\'m very slow at typing. How can I develop my typing speed ? How Can I Increase My Performance Of My Laptop? How can root my xperia z?